Aluminum Tank & Tank Accessories, Inc. Is a small family owned and operated business in Fort Worth, Texas. As a small family owned business who understands that customer service is the backbone to the future of this company…….and the country. They understand what trailer clearance and fuel slosh means to our customers. Auxiliary fuel systems have evolved over the years to meet the ever changing DOT, EPA, and etc regulations. Aluminum Tank & Tank Accessories, Inc. is proud of the MADE IN THE USA status. 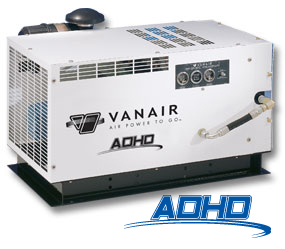 You can depend on Vanair’s proven performance job after job…year after year. Their products are designed to reduce operating costs…while increasing productivity. A simple flip of a switch turns your truck into a ready-to-go, industrial-strength “mobile workshop”… without tying up valuable truck bed space. Every product is backed by decades of industry experience and expertise…proven by the fact they are the only company to offer a lifetime warranty on its air end. Their in-house engineering staff is focused on continuous product improvement… providing custom mobile power solutions for their customers. Muncie has been serving the truck equipment market with mobile power components and systems for over 75 years. Dump trucks, refuse trucks, aerial buckets, tow trucks and dozens of other applications function in part because of the products they produce. Their primary objective is to deliver quality products and services to their customers. Reelcraft is the leading global manufacturer of the widest range of hose reels, cord reels and cable reels for industrial, commercial and professional applications. Reelcraft’s key focus is to produce durable, quality products that make hoses, cords and cables more productive, keep them easily accessible and make them last longer. Work smarter with Reelcraft’s complete line of spring-driven, motor driven and hand crank hose reels, cord reels and cable reels. As the industry leading provider of Aftermarket and OEM fuel tanks and fuel system components, Transfer Flow invests heavily in its manufacturing facilities, as well as its talented and highly experienced engineering team. From backup generators, utility bodies, and school busses – to armored personnel carriers, hybrid technology, and luxury resto-mods, Transfer Flow’s production and engineering capabilities evolve with customer needs as it delivers the highest quality products to manufacturers throughout the world. Strength and durability are inherent characteristics of every product manufactured at Transfer Flow. Taylor Pump & Lift Company Inc., building upon years of experience in the oil lubrication equipment industry, took that knowledge and experience and began a line of mobile lube trucks and trailers. They are not truck salesmen. They are one of the best lubrication equipment distributors who know how to fabricate and assemble the leading mobile lube trucks and trailers in the industry and back them up with a leading 5-year warranty! COXREELS® manufactures heavy duty professional grade hose, cord, and cable reels of the highest quality. Their comprehensive selection of reels includes spring retractable, hand crank and motorized hose, cord and cable reels and their patended EZ-Coil® Safety Series spring retractable reels with controlled rewind. They are the worldwide leader in the reel industry and have been serving customers in residential, commercial and industrial settings since 1923. Their engineering capabilities and manufacturing processes allow them to design and build top quality products for any conceivable application where reels are needed.